Crispin was picked up less than a block from his home by ICE while on his way to work. That was on October 25th, 2016. His wife Christina's story was featured on IMM Print on October 30th. I had just left for work in my car as usual when ICE stopped me one block from home. They’d been parked in the lot outside my apartment in an unmarked car waiting for me. After I pulled over into a gas station, suddenly all these other cars, and maybe ten or so other officers, appeared. At first I thought it was the police — and then I saw their uniforms and realized they were ICE. I had already been deported once, in 2009. That time, after they picked me up and took me to San Francisco, they forced me to sign deportation papers. They held me down by my arms and legs, but I told them I wouldn’t, that I was married to a U.S. citizen, that my kids were here, and that I had a marriage visa. They said they didn’t care. I was immediately deported to Tijuana. I stayed there a month. I tried to get back home, but I was caught and deported again. So I finally found a coyotaje who helped me back over the border. When I first got here, to the West County Detention Facility in Richmond, I was scared. I kept expecting to be deported, but I managed to get a lawyer and he helped me file for asylum in July. My request was denied. The judge made it clear that I probably wouldn’t be granted a bond hearing since I’d been denied asylum. But we are appealing the ruling and I’m now waiting for a new court date. I’ve always worked hard, and I want to keep busy, so I signed up to work here. I get up at around 4:00 in the morning to work in the kitchen, and then between 5:30 and 6:00 I help serve breakfast. I’m on a cleaning crew, and between breakfast and lunch we clean around the building. I usually have a few hours of free time before getting dinner ready at 3:30. There’s not much to do here if you’re not working; I usually watch TV or exercise in the yard. Then I have more cleaning to do at 9:30 p.m. before I can go to bed. The guards here are mostly OK. They used to have an officer here who, every time he was on duty, put a “closed” sign on his desk so no one could talk to him. Fortunately, he’s no longer here. I am in pain from a knee injury I received before I was detained. I had an MRI and was told I needed surgery and that it could be done here. But that was January 26th and I am still waiting. There’s one guy who’s been here a couple of months with a dislocated shoulder. He was hurt when ICE tried to force him to sign deportation papers. I usually see my family, my wife and daughters, every weekend, but not for the past few weeks. 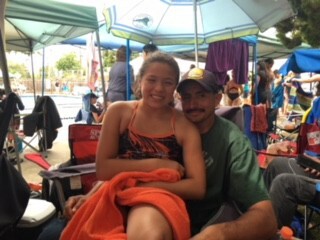 My wife works, plus she is busy trying to take care of everything at home and making sure my youngest daughter, Aiyana, makes it to her activities, including basketball and water polo practice. When Aiyana visits, I tell her everything will be OK, but she knows I could get deported again. My fourteenth wedding anniversary was August 23rd and this will be my second Thanksgiving here. I feel terrible I will be separated from my family for the holidays. When they visit, we are not allowed any physical contact. We speak on phones, from opposite sides of a glass wall. If I get deported, I’m coming right back to the U.S. I have to. This is where my wife and children are. And if I get released? The first thing I’m going to do is hug my family. I won’t give up. I won’t stop helping those that need help here.